New poll finds the unity government improved Netanyahu's popularity. Mofaz is still disliked. 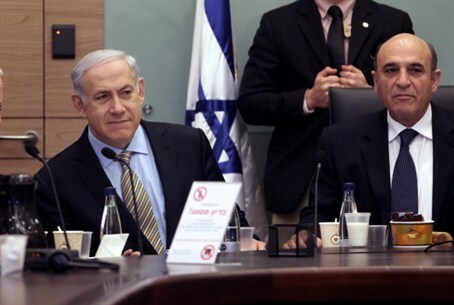 The unity deal which brought Kadima into Prime Minister Binyamin Netanyahu’s coalition was criticized by the leftist parties in the Knesset and led to protests against MK Shaul Mofaz. Despite all this, however, a new poll shows that the move seems to have played in Netanyahu’s favor. The poll, which was conducted for Channel 10 News on Tuesday by the Sample Project company, found that 44 percent of the Israeli public supports Kadima’s joining Netanyahu's coalition. In contrast, 37 percent said they opposed the move, while 18 percent of respondents claimed that they had no opinion on the subject. Not only that, the poll also found that Netanyahu continues to be the leading candidate were elections to be held in the near future. The poll found that 43 percent of the Israeli public believes Netanyahu is best suited to serve as Prime Minister. Mofaz, Netanyahu’s newest coalition partner, came in last with only five percent of respondents thinking he would be suited to serve as Prime Minister. Mofaz was beaten by Labor chairwoman Shelly Yechimovich, who received the support of 16 percent of respondents, Yair Lapid who was supported by eight percent of respondents, Yisrael Beytenu chairman Avigdor Lieberman, whom six percent said they believe would be fit to be Prime Minister. Mofaz had similar results when it was believed that early elections would take place. Those polls also showed that Kadima would head towards a major downfall from its present 28 Knesset seats. The latest poll also found that Netanyahu’s popularity index has risen by five percent. Tuesday’s poll found that after he postponed the elections in favor of a broad unity government, Netanyahu’s popularity index stood at 46 percent, whereas in a previous poll conducted before the announcement, his popularity was 41 percent. In January, Mofaz, who chairs the Knesset's Foreign Affairs and Defense Committee, called an abrupt halt to the committee's session, faced the cameras and publicly called the Prime Minister a liar. When former Prime Minister Ariel Sharon announced he would leave the Likud party and form a new party – Kadima – Mofaz vowed in a written letter to Likud members that he would remain in the Likud. The following morning, he joined Sharon.